Summary: This form of hydrotherapy has several health benefits such as improved circulation and increased blood flow. 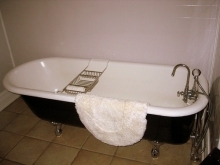 Contrast baths are the immersion of a body part alternately in cold and hot water. This causes alternate contraction and dilation of blood vessels, which increase blood flow, white blood cell activity, and the oxidation process to speed up healing. This treatment is based on the principle that by alternate contraction and dilation of the blood vessels, brought about by the contrasting application of heat and cold, the circulation is improved and the removal of waste products is hastened (Hydrotherapy in the Home, 12). 9. Make six to eight changes, ending with the cold water, except when treating rheumatoid arthritis, in which case, finish with a hot application. Total treatment time should be 20 to 30 minutes. 10. Dry the patient thoroughly and give cooling measures if needed, encouraging patient to rest for at least half an hour.